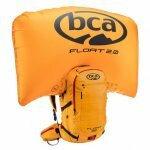 The Float 32’s 150-liter airbag not only creates buoyancy and decreases your burial depth but also protects your head and neck from trauma in an avalanche. BCA’s next generation Float 2.0 cylinder is nearly 30% smaller and 15% lighter than our Float 1.0 engine. All the Float 2.0 system elements sit entirely separate behind a zippered covering, freeing up valuable space in the main compartment for gear, first-aid kit, and supplies.